Discussion in 'Android Development' started by ceoceo39, Dec 22, 2008. Hi, I'm beginner with Android. The first simple code is a fault. I don't know how to fix it. Have anybody help me please??? I'm not sure if this will be of use anymore, but it looks like you are missing your R.java file in the package. It should be there under your sayhello.java file. Hope that helps. Can you oost contents of the main.xml file? You don't have a gen folder which has the R.java file in it. I say you start over from scratch and build it EXACTLY how the tutorial states. I think that the R.java file is automatically created when you make a new android project so you are probably not doing that right. It may sound paradoxical, I deleted the line on top of the [your main].java importing android.R. and it automatically resolved as normal. in my setting, I got my "automatically build" turned on. Even i got the same error. R can not be resolved. you should not import android.R. the gen folder on compilation automatically gets an 'R' class and this should be used in your app. 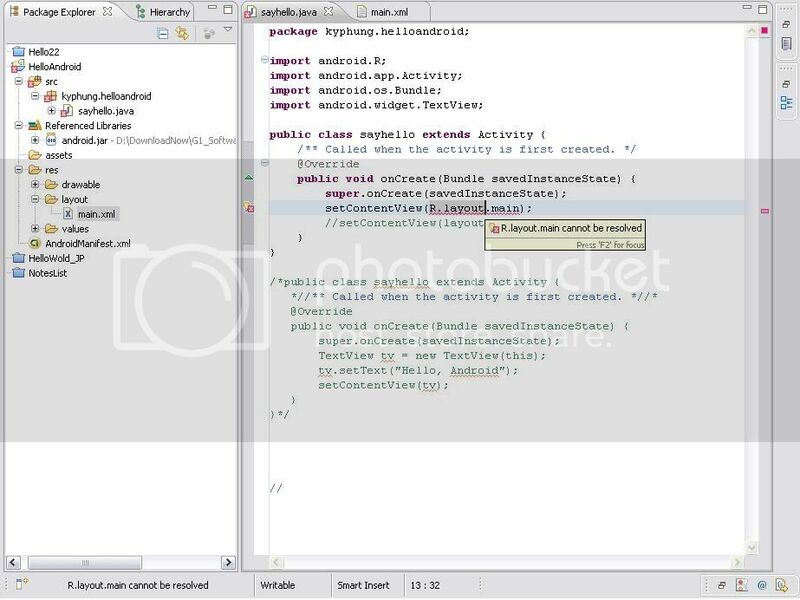 Note: this is the basic, un-modified sample app that comes up in NetBeans for an Android App. have u ever config the PATH? on my case problem was because of changing package of a java file and it didnt changed the autogenerated R.java package. When i changed the package back to original and removed import R.main. problem got resolved. if i remove android.R i get error at each button element in the below phrase. here also r.layout .main cant be resolved .. This problem still exist's even today I am trying to get this code to compile a straight HelloWorld application, based on a blank new project from Eclipse 'Kepler'(I think). If I am simply missing a file how do I generate the file' and whats in said file. A Blast from the past hopefully we can answer this for others this is my first post so HI and go easy. 1. Your layout is incorrect. Check all your XML files AGAIN AND AGAIN. you might think they are fine but they might not be so keep checking. 3. check your Jar dependencies. you may have an MD5 mismatch throwing it off. 6. Try closing out of eclipse and reopening it. Sometimes Eclipse doesn't immediately show you an error that may be in your XML files. Start by going through the xml files you most recently changed. Many thanks for all the reply's. As for the cleaning of my computer well ile get that can of polish out on the HD right away(Joking). 99% of the time this is caused by your xml layout file(s) not being correctly formatted. Once you confirm this then delete the android.R import and then Eclipse (or IDEA, etc) will import the proper package resources. If not I would next try to clean cache.